For years Field Notes has been asked to create a reporters style notebook. They released the limited edition Byline notebook in the summer of 2016 that was a huge success and were still asked for more. The Field Notes Front Page notebook is the permanent answer and will remain in stock indefinitely, sold as a 2 pack. Similar to the Byline with a few changes. The cover of the Field Notes Front Page is made of the same heavy duty 120#DTC Neenah stock but is a lighter grey. The interior pages have the same Cougar 70# text paper, a bright white college ruled paper with light gray lines. Once again the notebook is top bound with a Double-O binding but with black rings. Other than that the notebook is the same size and design as the Byline. The cover is designed to flip over the top and also protects the wire binding so it doesn't get caught on items. The size of the die-cut holes and the binding are designed for optimal "flippability." On the back cover is a handy pocket that also creates a thicker writing surface when writing with the notebook in hand. The Field Notes Front Page notebook is everything you loved about the Byline but is here to stay! Corners rounded to 3/8" (9.5mm). 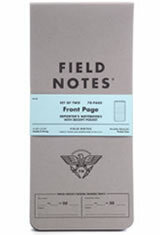 The Field Notes Front Page Memo & Notebooks usually ships within 1 business day unless otherwise specified. Each Field Notes Front Page Memo & Notebooks we sell is guaranteed to be genuine, authentic and will arrive brand new & unused!